How to mix a drink. my bar in the Italian alps – lots of drinks mixed here. It’s Sunday which means time for another post in my new series concerning, “The habits of the modern man.” Today we’re going to take a look at the process involved in mixing a drink. Being able to mix a drink well is a good skill to have. For a start it means that you’ll always be able to enjoy an excellent beverage if you have the ingredients at hand. You’ll also be able to prepare drinks for guests, particularly your “special lady friend.” The downside of knowing how to mix a drink is that you’ll no longer be able to pretend to enjoy the rubbish that is prepared at many bars. The drink that I’m going to use as an example, or as a baseline if you will, is a gin & tonic. The simplicity of this drink is an excellent place to begin, for although it only has a few ingredients it can be difficult to find a bartender who knows what he is doing. If you can’t mix a G&T well then what chance do you have with more complicated concoctions? To begin, let’s examine the most common way that this drink is prepared by your average barman with poor skills. Firstly they will take a random glass – it could be a highball or a tumbler or anything at hand. Then the barman will pour a measure of house gin into the glass. Next he will add some ice, usually not enough. Then he will pour some tonic water over the top. Finally he will stick in a slice of lemon. There is no way in hell that I will ever drink that concoction. The worst G&T that I ever had given to me was served in a paper coca cola cup. Needless to say, we exchanged words. I come to this topic with some considerable experience. I began working in bars when I was 18 and I did so full time for over seven years. 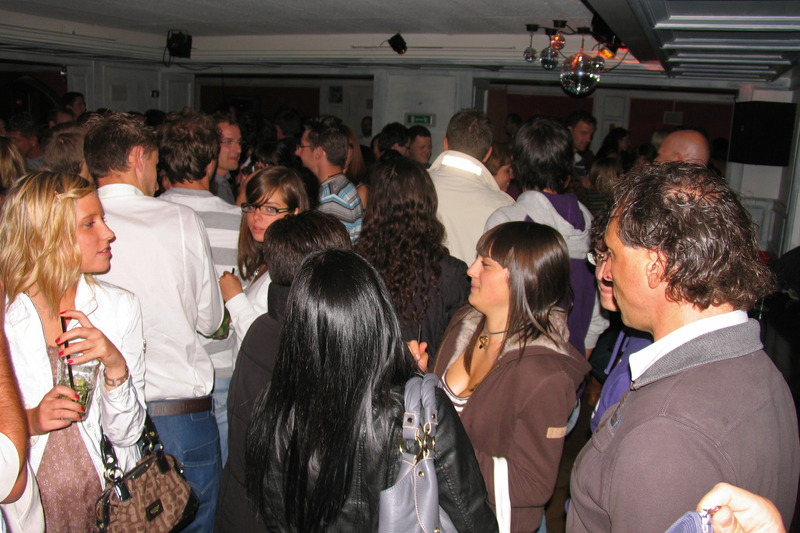 Then when I was living in Italy I opened my own late night bar which I operated for four years. We primarily served cocktails and mixed drinks. I have sampled some of the best bars in the world and whenever I meet a top bartender I always take the time to exchange tips and techniques to improve my own skills. In other words, you’re in good hands here. So back to my example of a poorly prepared G&T. The mistakes made can be identified on two lines – the ingredients used, and the order in which they were added to the drink. Mixing a drink is like chemistry. You need to add the ingredients in a certain order so as to maximize the flavors that are generated. This is easiest to demonstrate with a simple drink such as a G&T. So let’s start at the beginning. Keep in mind that I am introducing the various ingredients in the order in which they are to be used. Different drinks use different types of glassware. The correct glass adds to the structure of the drink and the enjoyment of the drinker. Likewise the quality of the glass itself will make a big difference. There’s nothing like drinking a fine whiskey in a beautifully cut and weighted whiskey tumbler. A G&T is what is known as a long drink. This then necessitates a glass that can hold an adequate volume. It does not necessarily mean that the glass itself has to be tall. I own some lovely Dutch glasses that are squat and round but they hold the same volume as your regular highball. They are stained blue and they make an excellent G&T glass. Another good option is a generous wine glass such as a nice Burgundy glass. I have enjoyed outstanding G&Ts in these on many occasions. a G&T in a Burgundy glass. Tip top, old bean. Here are the two golden rules for ice – you want lots of it and you want to add it first. You won’t add the ice first in every drink you mix but you certainly do in a G&T. Adding the gin first and then putting the ice on top means that you’ll be left with all the spirit sitting at the bottom. Not good. Also you want to have large ice cubes not little teeny ones. The reason is that the faster the ice breaks down the less time you will have to enjoy your drink. I like to make ice using leftover little yoghurt square tubs. They make the perfect size of ice for many drinks. Fill the glass to the top. The very top. Like in the above photo. Yep, you’re putting in the garnish next. 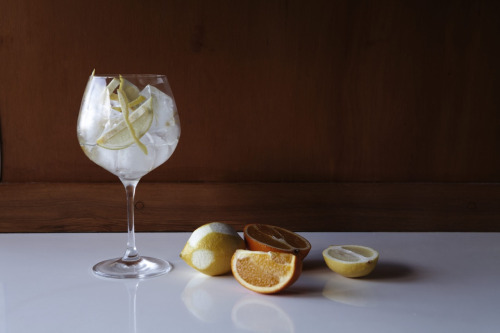 A G&T can be made using a variety of garnishes depending on the type of gin you are using. Remember, gin is a base spirit that is flavored with many different ingredients such as juniper berries. A typical gin will have more than a dozen such flavorings. For example, Hendricks gin is typically served with a long wedge of cucumber. Some gins are better with blood orange while others go well with lemon. My standard garnish is a few wedges of lime. At least two, but usually three. Stick them in there. Plymouth gin A beautifully structured gin by a company who have been in the business for a very long time. One of my all time favorites. Boodles gin Very clean with juniper and floral notes. Hard to find but outstanding. Tanqueray No. 10 A super premium gin with great botanicals. Hendricks gin Infused with rose and cucumber amongst other things, which is why a slice of cucumber is a winner in this one. There are many others that are worthwhile but we’ll leave it at that. Now we add the gin. Pour your measure, (I normally use about 40ml) into your glass. The gin will flow over the lime wedges and ice, infusing the gin with the lime and distributing itself over the ice. This is the key stage in preparing the drink. You don’t add the garnish to the spirit, you infuse the spirit with the garnish before adding the mixer. Otherwise the garnish, in this case the lime wedges, are just stuck in as an afterthought. The taste difference is noticeable. Now for the mixer. Once again, if you use a cheap tonic it will taste average, and the mixer makes up the greater proportion of the drink. Schweppes Indian tonic water is a fine product. I prefer it from the can. At the moment I’m using fever-tree tonic water which is expensive but it really makes the drink. Once you start enjoying a high quality tonic like this it’s hard to go back. A proper cocktail mixing spoon is a good idea here. They are long and thin which allows you to reach down to the bottom of the glass and give it a good stirring. Don’t be shy. Get in and give it a good go. Ladies like a straw so have some on hand. The best straws to use are paper straws, the ones with the twirly colored bands. Girls just love these and they are a fine way to complete your drink. So there you have it. How to mix a gin & tonic the correct way. Once you have mastered this you can start being more adventurous. Perhaps an Americano or a Negroni. But for now just master the gin & tonic. And if you don’t like the taste then this is a good opportunity to start maturing your palette. The G&T is the perfect drink when lounging around the patio on a hot summer day. And now you know how to make it properly. Enjoy. So it’s “Kill Climate Deniers” now?